Mike Mendes is a craftsman, but his toolbox holds no hammers; he wears a blacksmith apron even though he works with ink. His creations won’t please everyone, nor will they ever hang in a museum. Yet his work will last a lifetime—albeit on someone’s skin. Mike Mendes is a tattoo artist. On Friday evening, the 30-year-old Toronto-native artisan arrived in Montreal and went straight to Place Bonaventure, where the Montreal Art Tattoo Show was taking place from Sept. 9 to 11. While it was his first time tattooing in Montreal, Mendes was already fully booked. A tattoo artist for the past eight years, Mendes recalled when he first got inked at 16, and how the culture has changed since then. A hedgehog riding a bird. Awesome. 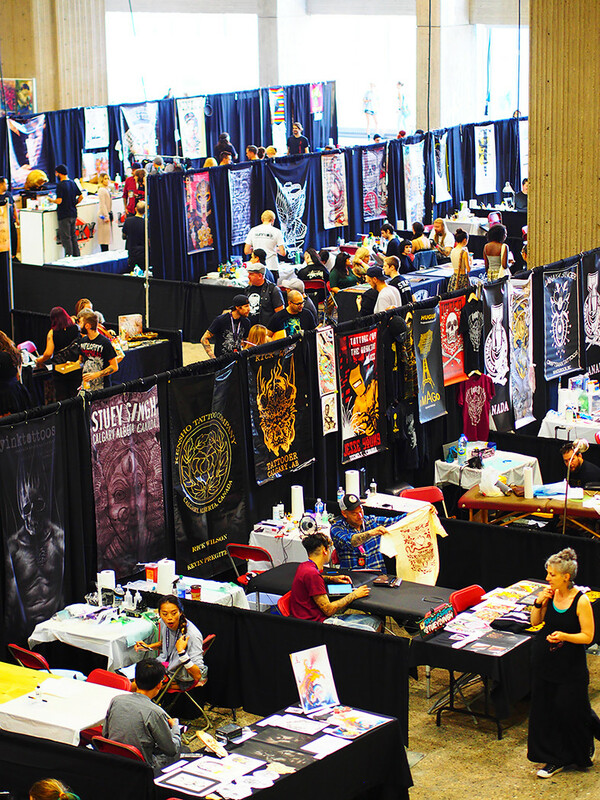 Pierre Chaplan, a tattoo artist himself and the organizer of this year’s Montreal Art Tattoo Show, said ripping off designs is a part of tattoo history and the scene today is no different. “I think tattooing has always stolen everything,” he said. “We copied people because we were inspired. I don’t think that’s a problem; it might be a compliment after all.” Chaplan gave the example of how Japanese tattoo artists today repeat original designs by Hokusai and Kyōsai—two artists from Japan’s Edo Period. Mike Mendes inking a client’s skin. This was Chaplan’s fourteenth year organizing the three-day event. Since the rise of social media, he has seen the show’s attendance grow from 3,000 visitors per year to 10,000—and the number of guest artists has increased to over 250. “Social media has made a huge difference. We posted a video on Facebook and we had over 2,000 shares and over 100,000 views without sponsoring or anything,” Chaplan said. Today, people are even using social media to book their tattoo timeslots in advance, he added. But even as social media has helped grow the show’s attendance numbers, it can also hurt the celebrated art form, according to Chaplan. 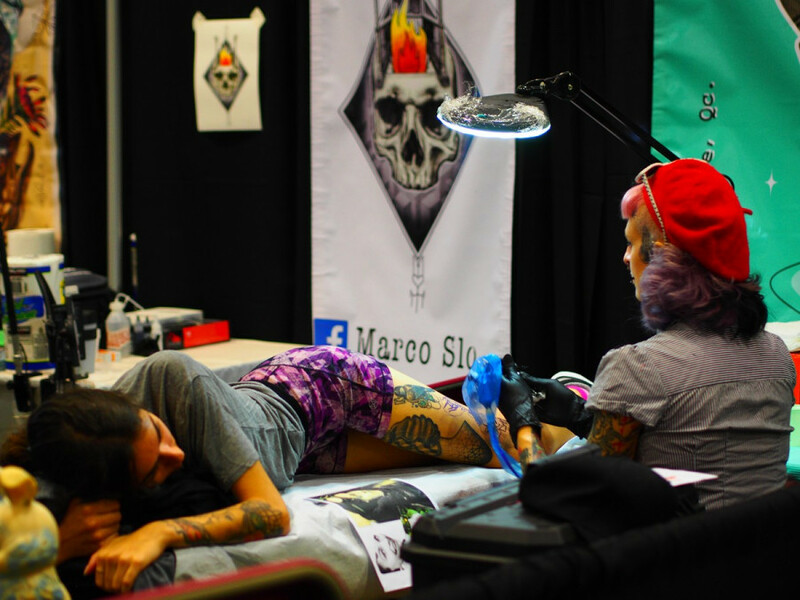 Mendes agreed that social media has opened a door for backyard tattooists to enter the industry, and he said a lot of them can “cheapen the experience” of getting a tattoo. “A lot of people who don’t really respect the tradition of tattooing are getting into it,” he said, explaining that those who are copying designs or buying kits off eBay and doing stuff out of their basements aren’t concerned about the practice. 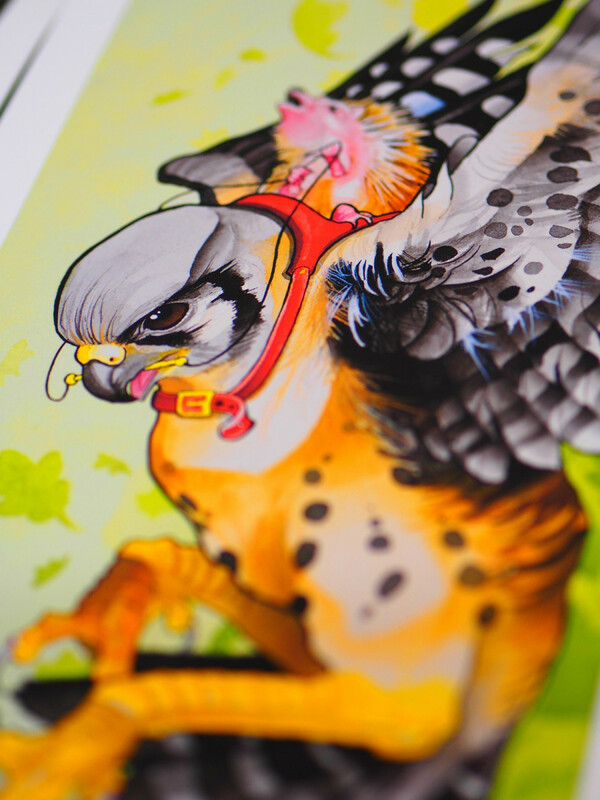 “I’m all for fun DIY stuff, but you have to know what you’re doing,” he said. The show has grown considerably to host 10,000 visitors. At the show on Friday night, 33-year-old Fan-Yee Suen stood across from Mendes’ stall, waiting for her turn to get tattooed. She made the trip all the way from Toronto to see the show and to get a tattoo from one of Mendes’ colleagues, Caroline Tattersall.